Twelve Wellesley graduates have won 2014 National Science Foundation Graduate Research Fellowships, which will support them as they pursue higher degrees in a diversity of fields. Several members of the community were also recognized by the national Goldwater and Udall Scholarships for their work in the sciences. 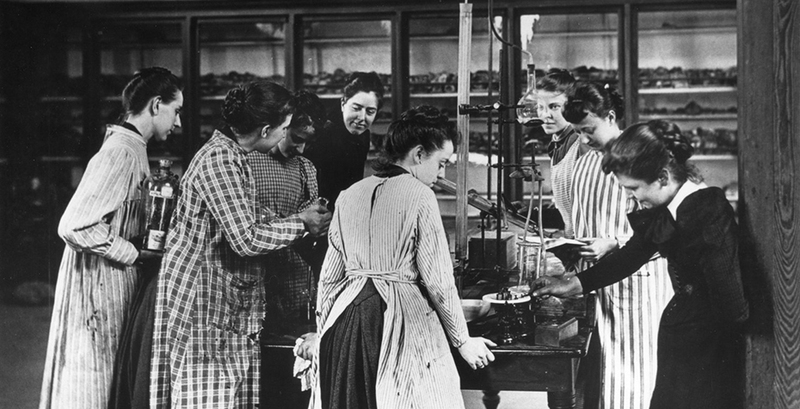 These women join a longstanding tradition of Wellesley scientists, mathematicians and engineers forging new paths in science, technology, engineering, and mathematics (STEM) fields. According to its website, the NSF Graduate Research Fellowship Program (GRFP) seeks to ensure the vitality of science and engineering in the United States and reinforce its diversity. The program recognizes and supports outstanding graduate students in NSF-supported STEM disciplines who are pursuing research-based master's and doctoral degrees at accredited United States institutions. The oldest graduate fellowship program of its kind, the NSF has awarded such fellowships to many pioneering scientists, engineers, and mathematicians. Past fellows include numerous Nobel Prize winners, U.S. Secretary of Energy Steven Chu, Google founder Sergey Brin, and Freakonomics co-author Steven Levitt. Fellows benefit from a three-year annual stipend of $32,000 along with a $12,000 cost of education allowance for tuition and fees (paid to the institution), opportunities for international research and professional development, and the freedom to conduct their own research at any accredited U.S. institution of graduate education they choose. NSF Fellows are anticipated to become knowledge experts who can contribute significantly to research, teaching, and innovations in science and engineering. This year, Elizabeth (Liz) Ferme ’12, Rebecca Fraenkel ’11, Willa Freedman ’11, Sohyun Han ’10, Maria Kaczmarek ’09, Caitlin Kearns ’10, Sarah Koopman ’11, Rosa Lafer-Sousa ’09, Elizabeth Clark ’10, Sarah Merrill ’10, Helen Qi ’14, and Elze Rackaityte ’13 were awarded fellowships. For Liz Ferme, the NSF fellowship is a capstone to a dream that began in her first few years at the College. “I didn’t discover my passion for mathematics until I was already at Wellesley,” she said. “My first exposure to math research was during the summer after my sophomore year. I barely even knew what math graduate school was—and I was embarrassingly bad at pronouncing famous mathematicians’ names.” Interested in University of California-Berkeley for graduate school, but wanting to take some time before making that decision, Ferme took a job at MIT’s Lincoln Laboratory, which she said was a “fantastic decision. My two years out of school have unequivocally convinced me that I want a math Ph.D.” Berkeley was convinced as well, and Ferme was admitted to her first-choice program to study mathematics: “a dream come true.” Winning the NSF fellowship means that she will not need to serve as a teaching assistant during her first year, allowing her to focus on her studies. In addition to the NSF Graduate Fellows, six alums won honorable mentions from the NSF, including Rachel W. Magid ’12, Siobhan O’Keefe ’10, He (Helen) Pu ’10, Rachel Roston ’11, Marjorie Schaeffer ’09, and Jennifer Yang ’12. Ashley Funk ’16 was named a Morris K. Udall Scholar, given to those dedicated to serving the environment, and Katherine Corcoran ’15 received an honorable mention. Both Carina Belvin ’16 and Monica Gates ’15 won honorable mentions from the Barry M. Goldwater Scholarship.